Orange Crush PIX CR100BXT, 100 Watt Bass Combo Amp All the class, tone and build quality you'd expect from Orange, in a compact, lightweigh..
All the class, tone and build quality you'd expect from Orange, in a compact, lightweight bass guitar combo. 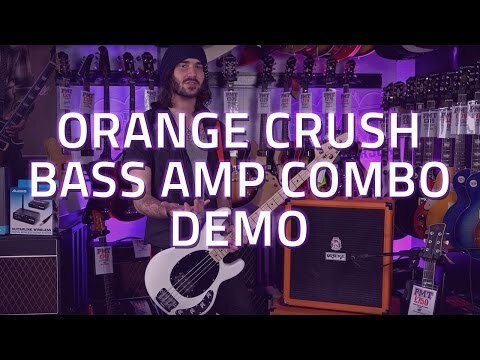 The Orange Crush PIX CR100BXT bass guitar amplifier combo is the perfect choice for practice and low level rehearsing. The four-band EQ allows you to dial in a near limitless range of tones, giving you plenty of space to work with when discovering those perfect sweet-spots. In addition to the usual Bass and Treble controls, the Mids section has been split into two: Hi Mids and Lo Mids, giving you exquisite control over each frequency range in turn. In addition to these you also have the Contour and Presence controls to further shape your sound. Contour, when cranked up, boosts both the bass and treble ranges whilst adding a slight cut to your mids, and Presence adds higher frequencies to the guitar tone, adding plenty of crispness and brightness to your sound. Featuring the same front grille as the world leading Orange valve bass series, the CR100BXT bass combo also includes headphone output for silent practice, a built-in tuner, and an aux input allowing you to practice along to your own choice of music. A 6.3mm jack powered speaker output is also available to power an extension cab, and a direct XLR line output can feed straight to a mixer or audio interface for recording! Unfortunately the Orange Crush PIX CR100BXT is now a discontinued model, so once our stock is gone... that's it I'm afraid. So order now, and avoid the crushing disappointment of having to shop somewhere else! Order today before 3pm for a guaranteed free next day delivery service, and don't forget to check out our range of finance options whilst you're at it (including 9 months at 0% interest! ).